Well Winter NAMM 2012 kicked off this past week and my initial thoughts at the beginning of the week were that it was going to be a bust. If trends mean anything (and apparently they do not) I was under the impression that NAMM was going to be stuck in the perpetual cycle of iterative software announcements. To my pleasant surprise however, we got to see a whole bunch of interesting hardware announcements. This is one of three serious analog synths announced at this year's NAMM. Analog seems to be back and in a big way. 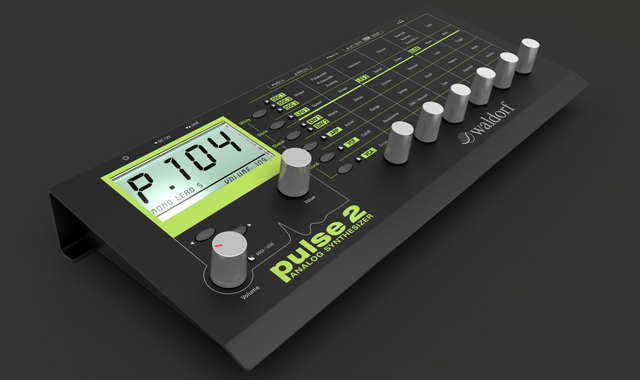 The Waldorf Pulse was the one that excited me the most, mostly because of its form factor. I can see this little guy sitting very nicely next to a Blofield and a DS Evolver. Perhaps garnering the most attention at the show was the Arturia Minibrute. This was a surprise for everyone since Arturia has never produced a hardware synth, let alone an analog. I have seen many a talk over at LivePA.org with excitement about the fact that there is a control for every parameter here. The steiner-parker (no idea what this means) filer also is garnering a lot of talk. Personally I am not excited about this one, but it has the Moog name on it and is MSRP'd at ~$650. I suppose that is enough for a Moog. Akai also seems to have come on very strong this year with a bunch of MPC stuff. The MPC Renaissance is a full on controller for the PC. The MPC Fly looks like a very interesting hardware interface bringing MPC pads to the iPad in a clamshell type case. They also have a nice grouping of Midi controllers that seem to be stepping up the level a notch. The final piece of gear that surprised me was the Nektar hardware controller for Reason. We have seen over the past couple of years a lot of dedicated controllers for Ableton Live. It makes sense that Reason would eventually get one too since it has such a constant interface. I am personally not a Reason user, but this controller has a really solid look to it. Two New DAW's Heating Up The Web: Will NAMM Sputter? Winter NAMM is coming up next week and normally I am pretty stoked to see what the world has to offer for musicians. The past couple years of NAMM's have been pretty boring though with not a lot on the horizon to get exicted for. Unfortunately, the trend seems to be following suit as the build up thus far seems to be pretty boring. Nothing really exciting is looming in the pipelines, at least not yet. I have seen two pretty cool new DAW's though that have popped up lately that seem pretty interesting. The first i heard about the other day is a new DAW called Bitwig. It looks to be an Ableton Live clone in many respects, but has some interesting fatures and Linux support. Not sure what to make of it yet as it still seems a bit too Livey to me, but it is nice to see another player in the live performance market. The next DAW (and I slightly hesitate to call this a DAW) isa product called AGL. IT is completely pre-Beta at this point, but the visual and audio demo below blew me away. At first it seems likea standard modular audio environment, no big deal right? As you see later in the video though the author has expanded the system to a three dimensional automation layout. It looks to not only be incredibly cool, but also incredibly powerful. Let hope these lead to some better innovation from the "big boys" showing up at NAMM next week.